Any building, bridge, tree or person have one thing in common – a strong foundation. In golf, a strong foundation starts in the legs and hips. This is where power is generated and where a smooth consistent swing starts and ends. Well putting is no different, except it has less moving parts in the upper body. So our next step to consistent putting deals three important aspects of putting that will improve your game. Eyes – I always start with my eyes. I stand with my dominant eye over the ball. I believe it is the best way to line up the center of your ball with the two marks you have chosen 3-feet in front and the further. Golf.com talks about your dominant eye and putting. 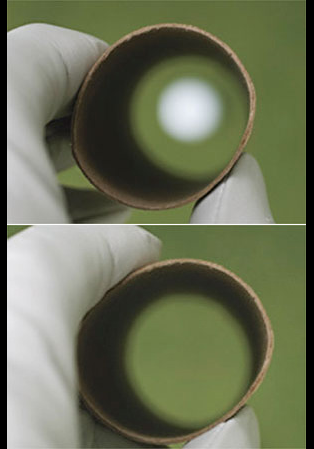 The article is very good and will help explain the importance of your dominant eye when putting. It is very important to keep your eyes on the ball when making contact. Additionally, I count to two before following the ball on its path; this ensures you follow through on your line and focusing on initial contact. Posture – Once your dominant eye is over the ball, bend your knees slightly so if you drew a line from your right shoulder to your toes and your knee are touching that line. Now, straighten your knees so you are standing comfortably. It is impossible for anyone to tell you how to stand, but your stance should be comfortable and allow a smooth shoulder movement. Building a Triangle – The putting triangle is not unique. Virtually all the resources I checked stated that the triangle between your shoulders, arms, head and hands is the key to good putting. I agree. Once you have formed your triangle, it is important to keep it solid through the entire swing. It is the foundation to a great putter. better-golf-by-putting-better.com describes the putting triangle perfectly and is worth a read! When putting your elbows and wrists must remain locked in position and the swinging motion is completed with a shoulder turn with very little lower body movement. This is something that is different for every player, but the mechanics are the same. Well that is it! These three points are my keys to putting success. The mechanics of putting is different to every player and unique to their skills. 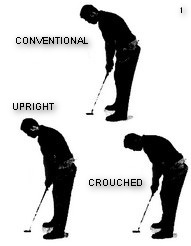 If you follow these three tips, I believe your putting will significantly improve. http://www.better-golf-by-putting-better.com/ – Excellent site dedicated to putting! http://www.youtube.com/watch?v=P60F_wu1pBk&list=UUuXIBwKQeH9cnLOv7w66cJg&index=16 – Lots of golf videos – Putting Triangle Drill is very good. http://www.golftipsmag.com/instruction/putting.html – Golf Tips Mag has many tips and an extensive putting library. http://golfhabits.com/ – Ian Hardie has many tips on putting and other aspects of the game worth reading. I am a grateful golfer – see you on the links!